Home » Blog » Deer? Oh Dear! I was talking with a friend the other day who was relating her account of a deer vs car collision that happened to her a while back. It brought to mind a couple of close encounters with Odocoileus virginianus (white-tailed deer) that I have had over the years. Our discussion also refreshed my memory that this is the time of year when deer are on the move, especially at dawn and dusk when they are particularly hard to see. Here in the Finger Lakes we have a sizable deer population. 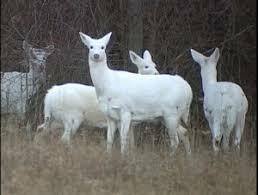 We even have a beautiful white deer herd living on the property of the former Seneca Army Depot. They are exceptionally attractive and people go on bus tours just for the chance to see them. You can see them in the city of Geneva; a friend saw a couple on Maxwell Avenue this year. Newspapers around the state report on deer that turn up in unexpected spots in urban areas and while they are elegant to look at they can be a real nuisance for farmers, gardeners, landscapers, homeowners and drivers. 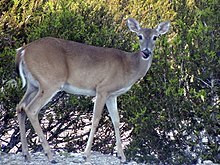 Deer are browsers and eat the tender branches of ornamental shrubs, trees and decorative plantings. They graze on the new growth along the edges of forest and meadows. Some gardening clubs offer classes on landscaping and planting with flowers and bushes that deer find distasteful. That may work, but it is small consolation when you love tulips, azaleas and rhododendrons and all you can successfully grow are daffodils! One thing I learned about deer is that most of the females in a herd are related to each other and if the doe “in charge” suddenly decides that a particular plant is edible the rest of the herd will follow her lead and begin to eat it. This can happen with plants, which in the past they have found distasteful not toxic, and one morning you might find all your Columbine, Purple Cone Flowers or Forget-Me-Nots may have been eaten. When I lived in a clearing in the woods I had to landscape with welded wire fence. Is it possible to outsmart Bambi… maybe, but don’t be too surprised if you fail. I have met many people who have had car and deer crashes just about any place you can name – parks, country roads, and highways. Several of my friends have been run into by deer that simply don’t see the car. I have also spoken to people who have had loved ones killed when the motorcycle they were riding collided with a deer. Deer can be dangerous as well as beautiful. From the ages of 0-20 I lived in a rural area and do not ever remember having deer in our yard, decimating our flowers or vegetable garden or seeing them dead on the road. What has changed? Why is the deer population so high? 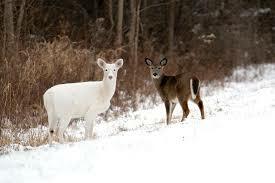 In the 1800s uncontrolled hunting and deforestation almost wiped out the white tail deer. Over 95% of the deer were wiped out of the United States during this time period. Deer management programs put in place to increase deer numbers were very successful in New York State and other Northeastern States. Another cause is that many marginal farms have been turned into housing developments and the deer found it easy to switch from browsing on apple trees and beans to browsing on tulips and decorative shrubs. Our current land use is ideal for sustaining high-density populations of deer. There are also local laws restricting hunting and landowner opinions of hunting and trespassing which limit the number of deer taken by hunters. One of the big reasons there are so many deer is that we no longer have a fully functional forest ecosystem. We have driven out most predators such as wolves, mountain lions, bobcats, bears, and coyotes. Though bears and coyotes are returning to their former land areas and mountain lion and bobcat sightings are reported there are not enough natural predators to deal with the large herds of deer we now have. Another problem is there are fewer hunters than in the past. Why is that? Many people have given up the sport of hunting because of the bad publicity it receives, or being raised in families where no one hunts, or living in urban areas where there is little or no opportunity to hunt. While hunting is certainly not strictly a male sport, I know some fine women hunters, it is a male dominated sport and in families where a woman is the head of house she may not have the time or inclination to introduce her children to sports like hunting and fishing. Couple this with the fact that most does have multiple fawns after their first pregnancy and you have the makings of a white-tail deer population explosion. Though many people find hunting distasteful and find the idea of culling the deer population sad at best and horrible at worst. The fact remains that with few natural predators and lots of places to roam deer become a problem. They can become ill and pass illnesses such as chronic wasting disease (CWD) onto healthy deer. (At this point CWD has not been detected by the Department of Environmental Conservation in New York State). If you live in New York State you have a 1 in 154 chance of hitting a deer while driving. New York State is 26th in deer-car collisions. Deer also have the potential to increase the spread of tick-borne illnesses like Lyme disease onto humans. Deer cause tremendous crop damage for farmers; in 2002 estimated deer related crop damage was $59 million dollars. So what can be done about deer overpopulation? A very good article on the subject can be found on the New York State Department of Environmental Conservation website. The website discusses the problem at length and offers ideas on how to deal with the abundance of deer. Like so many things in life too much of a good thing can cause problems. Apparently deer are no exception.